Your search for the best Pizza dough recipe stops here! 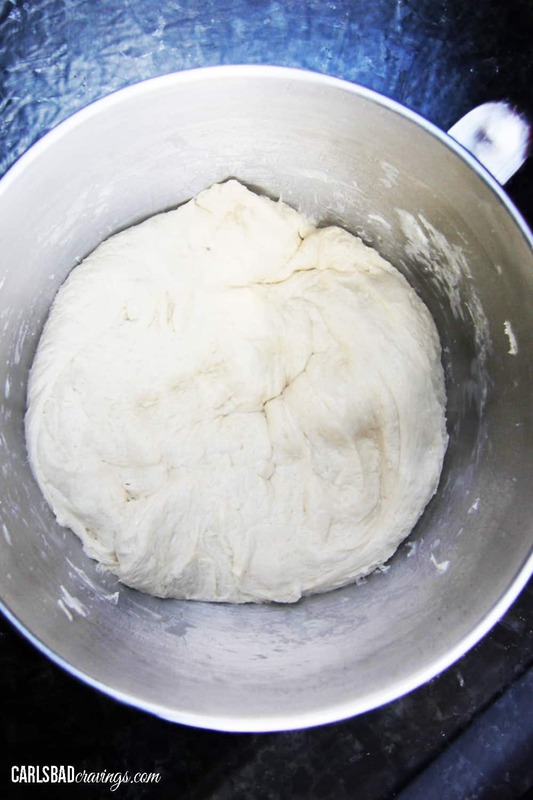 This easy Homemade Pizza Dough recipe is EVERYONE’s favorite – just read the reviews! 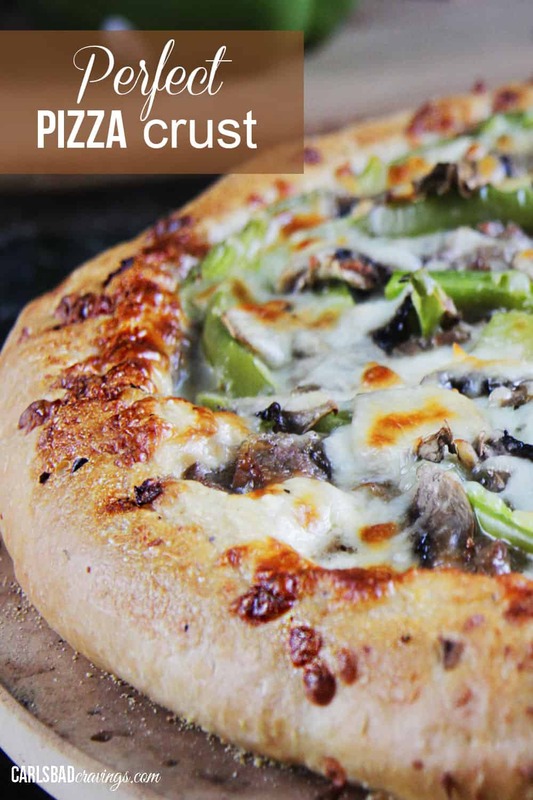 It creates soft, FLAVORFUL pizza crust every time perfect for whatever type of pizza you’re making – and it’s easier than you think! I’ve included step by step photos of how to make pizza dough including how to make ahead and how to freeze. So, skip delivery because you will never want to sink your teeth into another pizza crust again! Just like nothing compares to homemade bread, nothing compares to homemade pizza dough – not when it’s this homemade pizza dough. It’s thick, soft and chewy. It’s baked with olive oil and garlic salt for satisfying flavor every time – no bland pizza crust here!Once you make this homemade pizza dough recipe, you will never want to waste your money on store-bought pizza dough again – and you will be strongly tempted to make your own pizza instead of going out whenever you get that pizza craving – because I guarantee this will satisfy your pizza cravings! It’s fabulous in any pizza like Philly Cheesesteak Pizza as well as Stromboli and even pizza pinwheels!This pizza dough is also wonderful because you can refrigerate or freeze the dough! After you let the dough rise, you simply divide into balls, rise some more then store until ready to use. You can have homemade pizza dough at your fingertips at a seconds notice for an easy, fun dinner any night of the week! I consider myself a cook first and a baker second because I love the creativity in cooking and spices – whereas in baking I feel like I’m not completely in control because there are actual chemical reactions that go on – eek!For the longest time, anything with yeast intimidated me, until I actually tackled my first homemade pizza dough recipe. I couldn’t believe how EASY and how DELICIOUS it was! 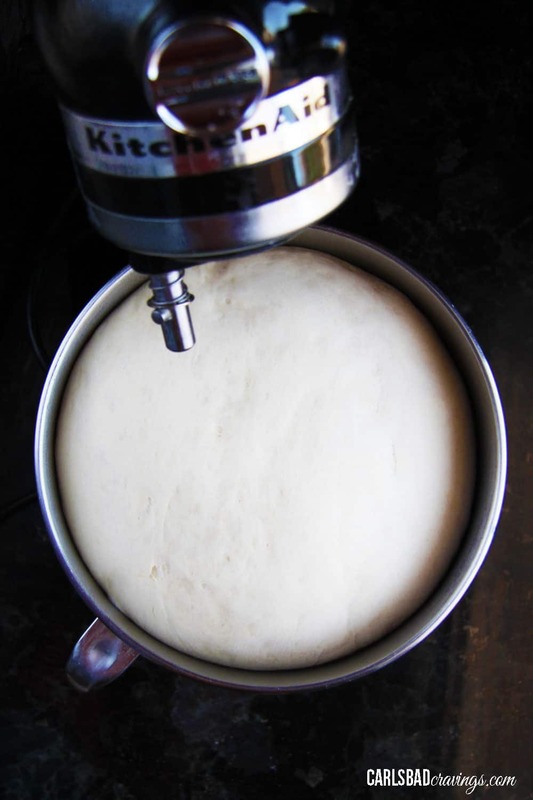 So, if you have never made homemade pizza dough before, PLEASE don’t be intimidated!I’ve detailed the process to make the easy pizza dough below with pictures and with more information than you need, so it’s a bit wordy, but that’s just to answer any questions you might have. TRUST me that it really is quick, easy, delicious and SO WORTH YOUR TIME! No time spent in traffic or lines at store, no added cost of tipping. This recipe has no added preservatives or chemicals that can be found in some pre-made crusts. This pizza dough recipe has so much flavor you will not want to go back to frozen, basic recipes again. My favorite is you get EXACTLY the versions of pizza you want. You get to customize the toppings, make a heart with the olives, or try fun new ingredients at home with no risk! This pizza dough is so forgivable, you can ignore it, come back to it and dinner won’t be spoiled. If you like thinner crust, you can simply roll out the dough more and bake it on a baking sheet. Master this pizza dough recipe and a new world of bread sticks and flatbreads opens up to you! INGREDIENTS FOR HOMEMADE PIZZA DOUGH? 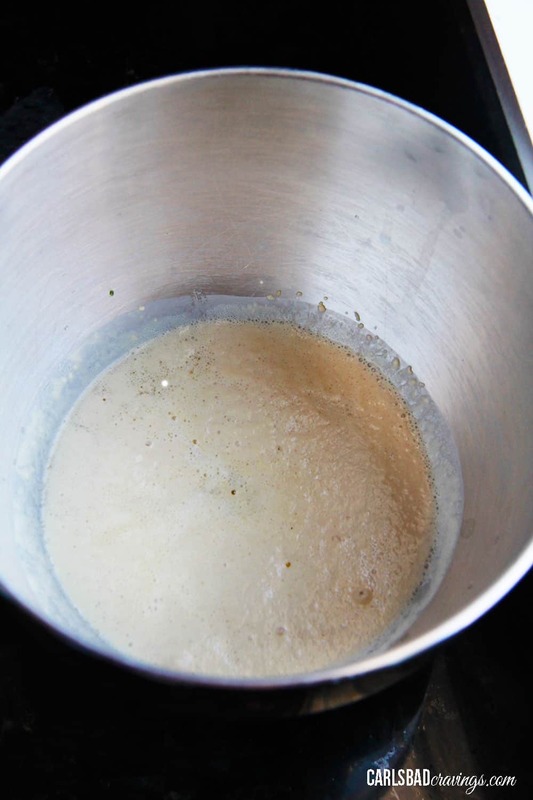 Water– it must be the right temperature to activate the yeast. Too hot will kill it, too cold will not feed it. I use a thermometer; you can also use the baby bottle method and feel the water on the underside of your wrist. Yeast– Active or instant (Rapid Rise) both work. Active yeast takes more time but is my preferred yeast. I go into more detail below. Sugar– AKA yeast food. Sugar increases the yeast’s activity! It also helps to tenderize the dough. Any sugar will do, you can even substitute honey. Olive oil– Any oil can be used but I’m a sucker for my EVOO! Don’t forget to brush the dough with olive oil before adding the toppings, which prevents the crust from getting soggy. Flour– Basic flour found in every pantry; unbleached all- purpose flour. I will give a more detailed explanation on flour below. Cooking spray, parchment paper- No ruined, sticking crust for us! Garlic Salt– my secret ingredient you will LOVE! Cornmeal– I love this added taste and texture, used as a barrier between the crust and pan/stone to keep it from sticking. WHAT KIND OF YEAST DO YOU USE FOR HOMEMADE PIZZA DOUGH? I used to use yeast interchangeably, because I did not know there were 2 distinctive kinds – Ooops! Luckily, I learned that lesson quickly. Active dry yeast, old school yeast has to activate, and rapid rise yeast (fast acting) you just add to the recipe.I recommend active dry yeast for the best pizza dough recipe as I find it results in a chewier crust. If you are short on time, however, feel free to substitute with instant yeast. Active Dry Yeast – This yeast requires being “activated” before you make your dough. Simply mix the active-dry yeast with warm water and some sugar(food) and let it sit and ferment for a few minutes, it multiplies. Then you’ll add the bubbly mixture to your dry ingredients and oil. Active dry yeast dough also requires a time to rise– usually an hour or two – before baking with it. Instant Yeast (Rapid Rise Yeast, Fast Acting) – is just that: fast. There is no need to proof the yeast with warm water. When using fast acting yeast you just add it to the dry ingredients. You then add the warm water to the dry ingredients and mix until the dough comes together. There is little or no rise time with instant yeast, usually just let the dough rest for about 10 minutes before rolling out. Bread flour: has more protein and therefore will yield a crispier crust. Wheat flour: I don’t recommend all wheat flour or your crust won’t rise as nicely but you can use half wheat flour and half all-purpose flour to give it more wholesome taste. I would also add a tablespoon of honey with wheat flour. Gluten free flour: you can use gluten free 1:1 all-purpose baking flour like Bob’s Red Mill. Keep in mind that because there is no gluten, the rolling out process will be trickier, so pull and push the best you can. WHAT KITCHEN TOOLS DO I NEED FOR HOMEMADE PIZZA DOUGH? I like to use an instant read thermometer to make sure my water is in that tight range of temperature needed to activate yeast. I love my Pizza stone! There are many options, find the right one for you – you can even find steals at TJ Maxx. I also like a pizza pan. I recommend using a vented one so that the crust cooks faster. I use my stand mixer because it saves time, elbow grease and it keeps my hands from getting gooey – but it’s not necessary – the dough will just take a few more minutes without one. STONES OR PANS BEST FOR PIZZA DOUGH? Let’s talk more about stones verses pans and which one is best for homemade pizza dough.Rachel Arndt did a cooking test between sheet pan and a stone. You can read the details here. In conclusion, I think if you buy high quality, it just comes down to personal preference. Or nostalgia!I Love my pizza stone, so there is no going back for me. However, you can still get a perfectly crispy and tender pizza crust full of flavor with a pan. Make sure to use each item how it is intended to be used. It’s important that the crust cooks quickly and completely to avoid soggy, undercooked pizza. Pizza Stone: The crust begins cooking immediately as the dough is placed on the hot stone which results in a beautify crispy crust. Preheat the stone in a hot oven for 30 to 60 minutes, grease (spray, or parchment paper) and dust with cornmeal. Be very careful when working with hot stone – I’ve got scars to prove it! Pizza Pan: A perforated pan is a must. Preheat pan to aid in the pizza dough cooking as quickly as the toppings. Cook in the middle or bottom of the oven. There is delay with a pan vs stone, as the pan doesn’t heat as hot, but that obstacle is minimized with a perforated pizza pan. Add olive oil, salt, and 1 1/2 cups flour and mix well with your hook attachment. If you don’t have a mixer, you can start to mix with a wooden spoon. Continue to mix while gradually stirring in 2 more cups of flour.Once dough has pulled away from the bowl, continue to mix for 5 more minutes on medium-low speed (or by hand). You may need to place a hand on your mixer so it doesn’t fly off your counter!What if my dough is sticky? If your dough is too wet and is not pulling away from the bowl, add 1 more tablespoon of flour at a time (up to 1/4 cup) until dough barely sticks to your fingers. Shape the pizza dough into a ball and place back into your large mixing bowl that has been coated lightly with olive oil or nonstick cooking spray. Turn dough over to coat with oil on all sides. Cover dough tightly with plastic wrap and allow to rise in a warm environment (75-80F), until it has doubled in size. Depending on your yeast (active dry yeast takes longer than instant yeast), climate, etc. this will take between 1-2 hours. Guestimating 15 minutes before your dough is ready, place your pizza stone or baking sheet in the middle rack of your oven set to 475 degrees F. You want to “bake” your stone for 30-60 minutes in order to get it nice and hot. After pizza dough has doubled in size, punch down to release the air. Then remove the dough from bowl, knead a couple times to further release the air then divide into two equal balls. Cover the balls with a towel for 15 minutes to allow them to rise further. Carefully remove your pizza stone/baking sheet and GENEROUSLY grease the entire surface with olive oil or with nonstick cooking spray (I like to spray like crazy). Sprinkle with cornmeal for added flavor, texture and to prevent sticking. 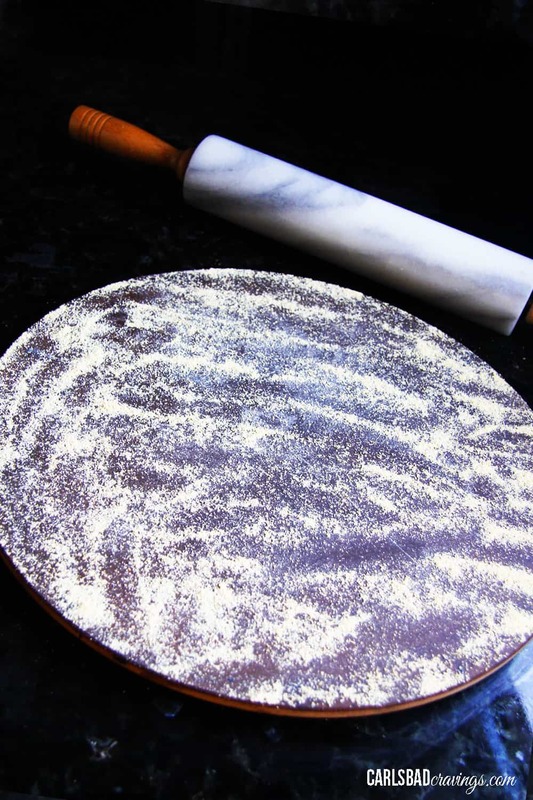 After 15 minutes, roll dough out onto a lightly floured surface or nonstick slip mat into a 12-inch round circle. Transfer pizza dough to your baking dish or pizza stone then pinch edges to create a rimmed crust.Once your pizza dough is on your pan, try scooting the dough – if it slides easily you are good to go – if not, you need more nonstick cooking spray and cornmeal. Lightly brush the top of the pizza dough with olive oil and sprinkle with garlic salt. This will add flavor and prevent the dough from getting soggy with the toppings.Using a fork, prick several holes in the dough to prevent bubbling. 11. ADD TOPPINGS AND BAKE! Bake for 12 minutes with favorite toppings then broil to cheesy bubbly golden heaven. Do you have to bake pizza dough before adding toppings? Make sure you proof your yeast. You don’t want to go through all the work of making pizza dough only to find it doesn’t rise! I don’t recommend bleached flour. Stick with unbleached flour because it has a denser grain and will provide more structure. The amount of flour can vary depending on humidity and elevation, so add enough flour a little at a time so it is tacky but not sticky. Before you add more flout, keep in mind it will become less sticky the longer it is kneaded. The dough is done kneading when it is soft but bounces back when pressed with your finger. Let the pizza dough rise slowly, it allows time for fermentation, which really develops flavor. This is why I prefer active instead of instant yeast. Don’t forget to brush the dough with olive oil before adding the toppings because it prevents the crust from getting soggy. Use fabulous pizza sauce! I like to use my own marinara or store-bought marinara with added Italian seasoning and red pepper flakes. Top the pizza sauce with a thin layer of cheese. This helps the toppings stick. I then like to add toppings and more cheese. What isn’t made better sandwiched in cheese? Use FRESHLY grated mozzarella cheese. Pre-shredded cheeses contain anti-clumping chemicals which prevent the cheese from melting as easily. More importantly, freshly grated tasted better! Watch the pizza carefully, especially once you start broiling. The pizza goes from almost done to too brown fairly quickly -so be careful! To avoid burning your mouth on lava hot sauce, let the finished pizza cool for at least 5-10 minutes before cutting and serving. You will taste the flavors better when pizza is cooled. Can pizza dough sit out all day? You can actually over-proof your pizza dough! I don’t recommend letting the dough sit out longer than 4 hours. You don’t want it to rise too much and cause over-fermentation and a super yeasty flavor. Can you refrigerate homemade pizza dough? Absolutely! 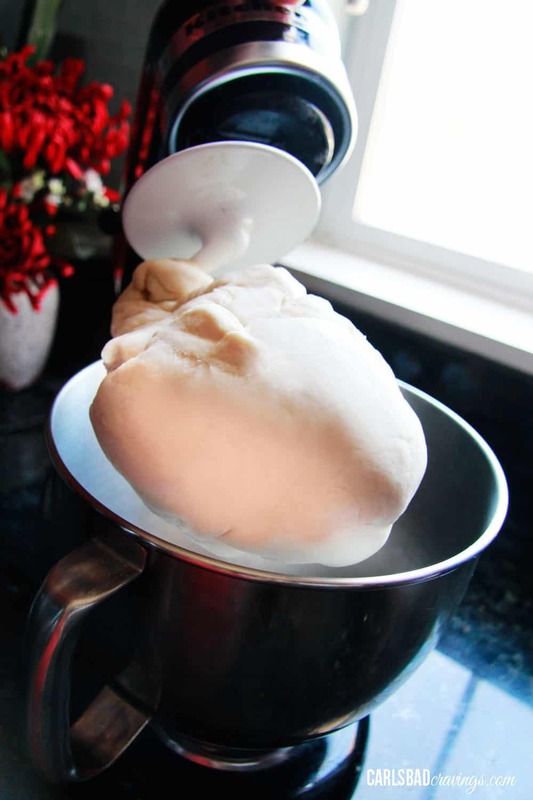 You will want to let the dough rise completely before refrigerating (through the 15 minute second rise), then tightly wrap dough balls in plastic wrap.Dough can stay in the refrigerator for up to 2 days. For best results, use pizza dough or freeze beyond that.When ready to use, unwrap the dough and place it on floured surface or parchment paper. Let the dough come to room temperature before rolling out. Yes! This easy pizza dough recipe makes two pizza crusts so you can either bake them both now or use one now and freeze one for later. You can also make the dough in bigger batches very easily so you can freeze more dough – which means more ready to eat pizza later!You can freeze pizza dough as a ball or as a roll out, unbaked crust. In either scenario, dough can stay in freezer for up to 3 months. 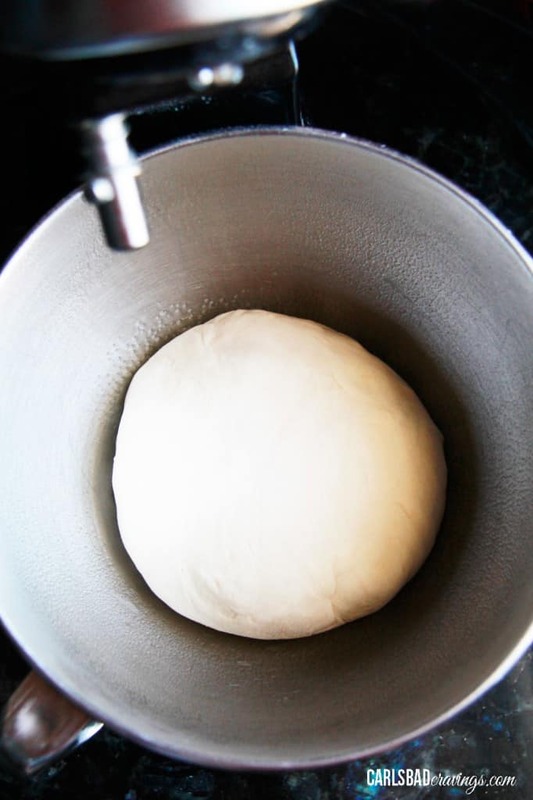 Dough balls: Let the 2 balls of pizza dough rise completely (through the 15-minute second rise). Lightly spray all sides of the dough balls with nonstick spray, remember I love my spray! Place the dough into separate ziploc bags, squeezing out any air. Flattened dough: separate flattened pizza dough with parchment paper, then stack. Cover tightly with two layers of plastic wrap followed by foil. To Thaw: When ready to use, thaw dough in the refrigerator for about 12 hours. Bring to room temperature by placing on counter, this should take about 30 min. Vegan pizza dough: This easy pizza dough recipe is naturally vegan so you can keep it that way with your choice of toppings. Thick-crust pizza dough: this recipe will make two thick crust pizzas for your enjoyment. For even thicker crust, roll out the dough smaller so the crust will be thicker. You will need to adjust baking time accordingly. Thin crust pizza dough: you get twice the fun by making two 12” crusts out of one ball of dough or you can use one ball and roll it out thinly on a baking sheet. You will need to adjust baking time accordingly. Individual pizzas: If it’s a party or you simply want individual pizzas for family night, you can divide the dough into 4, 6 or 8 pieces and roll out. Ingredients: Play around with the special ingredients to add fun flavors to the pizza dough. Try roasted garlic pieces in the crust, or some Italian seasoning. Sprinkle on some parmesan cheese, etc. Not looking for pizza? 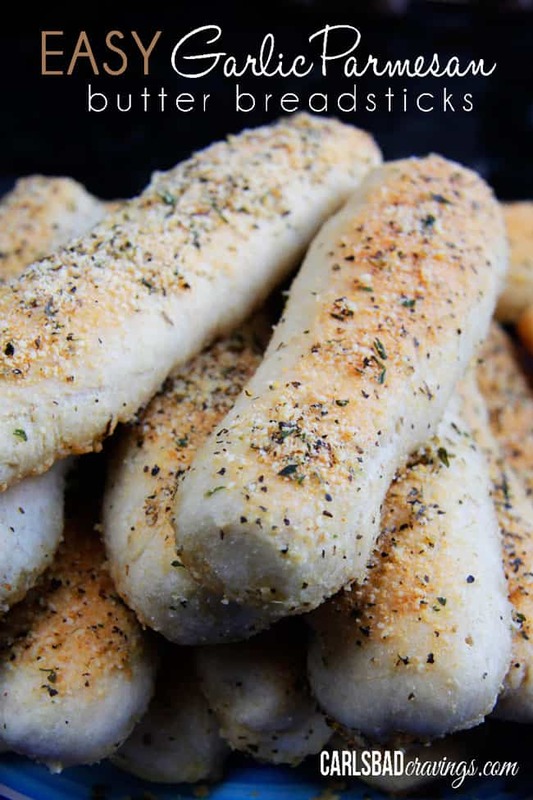 Try breadsticks, Stromboli, focaccia or cheesy rolls! HOW DO I REHEAT HOMEMADE PIZZA? If your pizza is all baked and you have leftovers (not likely), it is easy to reheat. You can reheat pizza in the microwave at 30 second intervals or in the oven. To reheat pizza in the oven, wrap it in foil and bake at 375 degrees F for 10 minutes. WHAT DOES PIZZA AND HOMEMADE DOUGH COME FROM? If you’re still reading, I find the history of pizza fascinating! Where did our beloved pizza dough and pizza come from?The most common understanding is that pizza is Italian, but it is probably more Greek or even Middle Eastern than Italian. Marco Polo brought an early version of pizza (flatbread) with him to Italy. The flatbread came from China. Our Italian friends took the Chinese flatbread and improved on it, adding cheese and tomato sauce.In 1905, the first pizzeria was established in the United States. G. Lombardi’s, is still open today using its original oven, although it has changed location.Whether the New York style or Chicago deep dish is closer related to what Marco Polo shared, all that matters to me is that I get to stuff my face with PIZZA. So, we have both countries to thank for our American version of pizza! Get Creative with your Pizza dough! A fun fact about how we got Pineapple Pizza: “We just put it on, just for the fun of it, see how it was going to taste,” Panopoulos told the BBC earlier this year. Sam Panopoulos was born in Greece and moved to Canada when he was 20. In 1962, to attract customers to one of his Ontario-based restaurants, they put pineapple on a pizza and tried it out.“We were young in the business and we were doing a lot of experiments.” Panopoulos said he and his brothers enjoyed the contrast between the pineapple’s sweetness and the savory flavor of the ham also added to the pizza. They named it Hawaiian pizza after the brand of canned pineapple used on the pie.I, for one, am so glad they experimented as it is one of my favorite types of pizza! I hope you have fun experimenting with my pizza dough recipe. I sure have! I can’t wait to hear what you make! 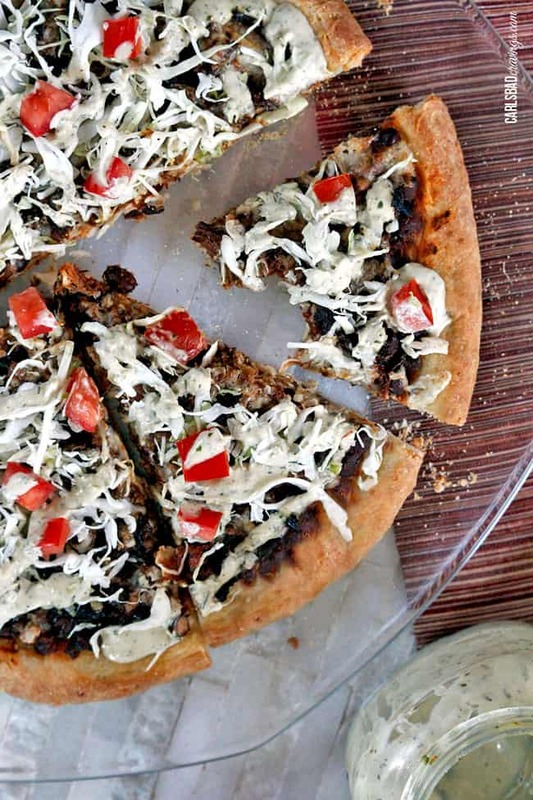 Want to try this Pizza Dough Recipe? Pin it to your PIZZA, BAKING or DINNER Board to save for later! Your search for the perfect Pizza dough recipe stops here! This easy Homemade Pizza Dough recipe is EVERYONE’s favorite – just read the reviews! 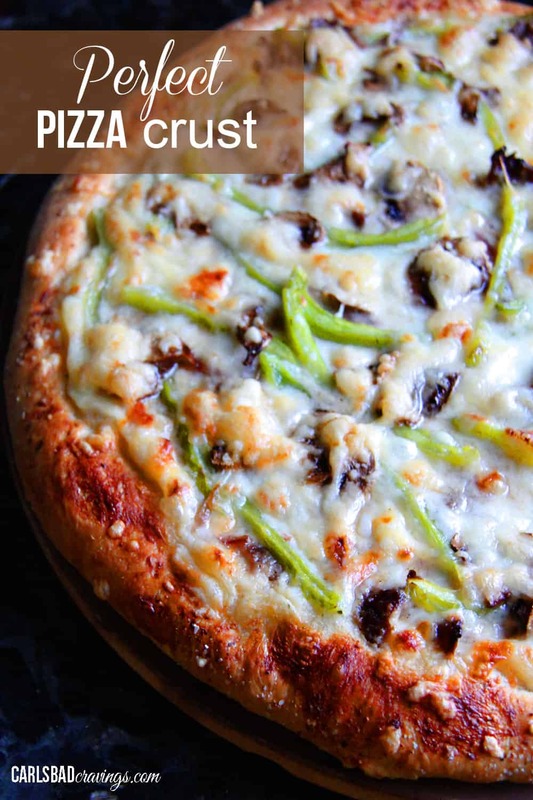 It creates soft, FLAVORFUL pizza crust every time perfect for whatever type of pizza you’re making. I’ve included step by step photos of how to make pizza dough in the post and the notes include how to make ahead and how to freeze. So, skip delivery because you will never want to sink your teeth into another crust again! In a large mixing bowl or the bowl of your stand mixer (preferred), stir in water, sugar and yeast. Let sit 5-10 minutes or until the yeast is foamy and dissolved. Add olive oil, salt, and 1 1/2 cups flour and mix until combined with your hook attachment (or with a wooden spoon if not using a mixer). 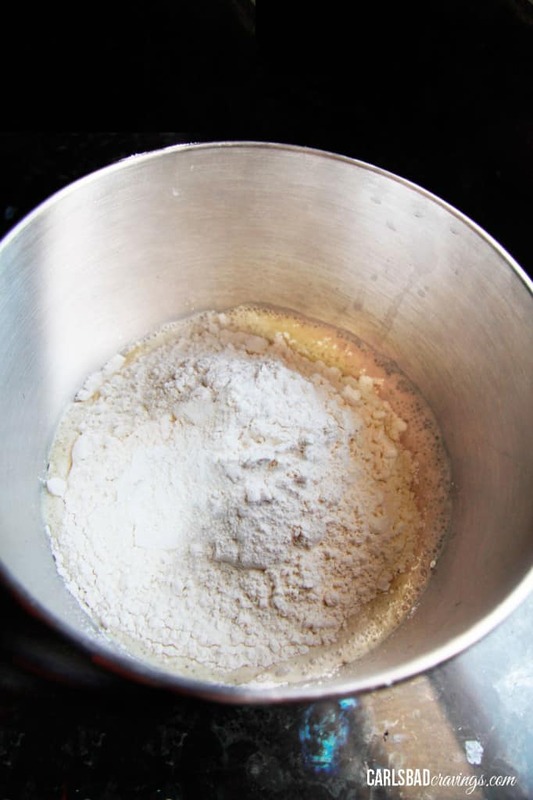 Gradually mix in 2 more cups of flour until dough starts to pull away from the sides of the bowl. If your dough is too wet, add 1 more tablespoon of flour at a time (up to 1/4 cup) until dough barely sticks to your fingers. Once dough has pulled away from the bowl, knead in mixer on medium-low speed or by hand for 5 minutes. Shape the dough into a ball and place back into your large mixing bowl that has been coated lightly with olive oil or nonstick cooking spray. Turn dough over to coat all sides. Cover tightly with plastic wrap and allow to rise until doubled in size, 1-2 hours. Guestimating 15 minutes before your dough is ready, preheat your pizza stone or baking sheet in middle rack of your oven for 30-60 minutes at 475 degrees F.
Carefully remove your pizza stone/baking pan and GENEROUSLY grease the entire surface with olive oil or with nonstick cooking spray. Sprinkle with cornmeal. 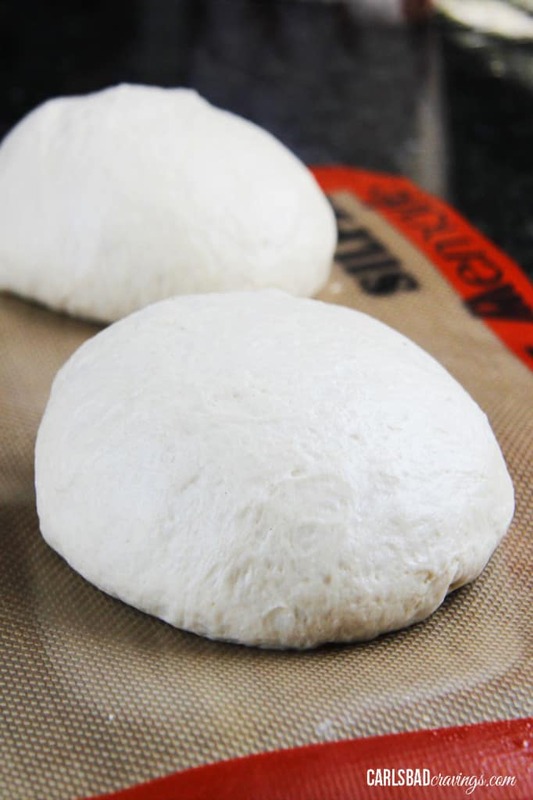 After dough has been resting 15 minutes, roll each dough ball out onto a lightly floured surface or parchment paper into a 12-inch round circle. 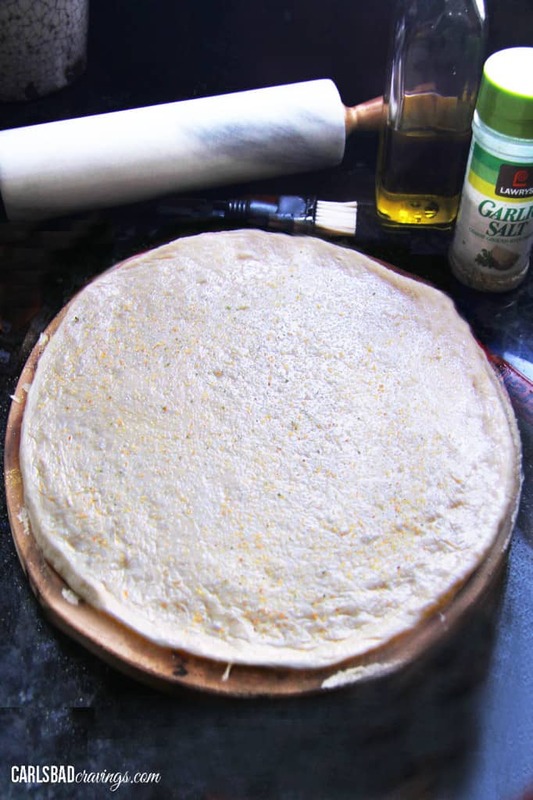 Transfer pizza dough to your baking sheet or pizza stone then pinch edges to create a rimmed crust (if you have trouble transferring, you can place your entire piece of parchment paper on your stone/baking sheet and bake directly on your parchment paper). Lightly brush the top of the crust with olive oil and sprinkle with garlic salt. Using a fork, prick several holes in the crust. Bake for 12 minutes at 475F degrees with favorite toppings then broil for 2 minutes or until cheese is golden. After the 2 balls of pizza dough have risen (Step 4), you can refrigerate 1 or both of the balls of dough. Tightly wrap dough balls in plastic wrap. Refrigerate for up to 2 days. For best results, use pizza dough or freeze beyond that. When ready to use, unwrap the dough and place it on floured surface or parchment paper. Let the dough come to room temperature (about 30 minutes) before rolling out. After the 2 balls of pizza dough have risen (Step 4), you can freeze 1 or both of the balls of dough. Lightly spray all sides of the dough balls with nonstick spray. Place the dough into separate ziploc bags, squeezing out any air. When ready to use, thaw dough in the refrigerator for about 12 hours. Bring to room temperature by placing on your counter for approximately 30 minutes. Preheat pizza stone/baking sheet as in Step 3, then skip to Step 5. OMG! I’ve tried different recipes but I just must say that this one is it!!!! I just made one and added shredded mozzarella, fried some shrimp half way and baked on parchment paper. It came out PERFECT! My daughter is on her third slice! Thanks for a great recipe!! WAHOO! I’m so pleased you finally found the perfect pizza dough recipe! And I love the sound of your pizza with fried shrimp – mmmm! Could I use regular bleached flour? Hi Sue, I recommend unbleached flour because it has a denser grain and will provide more structure. Could I let the dough rise for longer than two hours? Hi Jessica, you could let it rise for up to 4 hours, but you would have to watch it. You don’t want it to rise too much to prevent over-fermentation and a super yeasty flavor. I just made your pizza dough today.It is wonderful.I have been trying recipes for years,trying to get one I liked.The instructions were very good & easy to follow.Thank you so much for sharing. You are so welcome Brenda! I’m so pleased you finally found a winning pizza dough recipe! Thank you! Hi Eilene, if every recipe you make is still “sticky” it might be because you aren’t kneading it long enough. I would try kneading longer and see if that helps.